Vertical gardening is one hot trend. It saves space, makes harvesting a snap, and looks super cool. Lots of crops take kindly to being trained to grow up a trellis; perhaps none more so than the cucumber. They take up a lot of garden real estate, so growing cucumbers vertically just makes sense. I’m forever looking for clever ways to grow my cukes up, instead of letting them take over the garden. I recently came across this cool cucumber trellising technique that keeps the vines off the ground and makes harvesting a snap. Because cucumber vines produce tendrils that easily wrap around things, the chicken wire used on this system makes perfect sense. The plants climb up the trellis with little help from the gardener, and as a result, the fruits are very easy to harvest – there’s no bending required! The owner constructed this trellis by first making a PVC frame for the chicken wire and attaching the frame to the vinyl fence that surrounds the vegetable garden. Then, the chicken wire was attached to the frame using plastic zip ties. Seeds were planted every six inches across the base of the trellis. Once the plants began to grow, the gardener simply encouraged the vines to grab onto the trellis, instead of spreading out into the garden. What a clever method of growing cucumbers vertically! The same technique could be used to support pole beans, melons, winter squash, and other vining crops. And, if you don’t have a vegetable garden, you could even use this method to grow ornamental vines, such as morning glories, moon flowers, firecracker vines, and lots of other annual climbers. In the comments below, show us your best vertical gardening techniques. We’d love to hear about them! This easy-to-make chicken wire trellis is perfect for supporting cucumbers, pole beans, and small melons. I’ve been growing my pickling cukes in tomato cages for a few years now. About 4 plants per cage. Works like a dream. I have been using metal conduit and simple netting to do this for years! Cheap and sturdy when you slide it over two foot rebar driven in a foot. 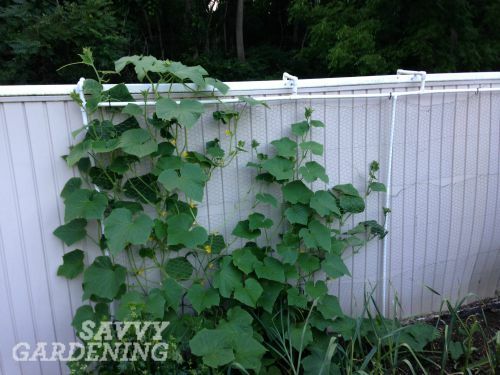 Looks inconvenient to reach any cukes that form behind the chicken wire. Suggest a slightly more open mesh.